The next phase of our campaign to secure the long-term future of our co-curricular activities is now underway. To understand why we need your support read the Help Us Strive Higher leaflet. Please consider making a regular gift. In doing so you will contribute to a lasting legacy for the benefit of current and future pupils. 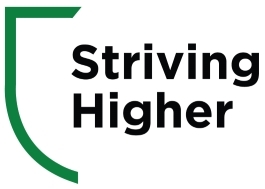 To make a gift or set up a regular direct debit click on the Striving Higher logo. Remember to tick the Gift Aid boxes so your gift goes 25% further! Thanks for supporting the campaign, we are hugely grateful to all who wish to support the future vision and greatly appreciate every gift, large or small. Alongside centenary celebrations we are embarking on an ambitious development campaign ‘Striving Higher’ to sustain our co-curricular programmes and in the medium term to improve facilities in Science Technology Engineering and Maths (STEM), Languages and Sport. To realise these ambitions we need to raise £1M+ over the next 3-5 years and £3M+ over 10 years. Through our Striving Higher campaign we intend to build up a Foundation fund to sustain future developments, co-curricular activities and our benevolent funds. To place our co-curricular activities on a self-sustaining footing we need to raise a further £3M+ over the next 10 years. We believe that this campaign will draw support from a range of sources, such as grant making bodies, our alumni, gifts in will, individuals and families giving regularly, and through specific project related appeals to our community. A Direct Debit or Standing Order is the most simple and convenient way to give. This helps us to best plan for the future and leverage match funding. You can also download our Donations & Gift Aid Form. This will also have the details you need to set up a standing order by your on-line banking or via your bank’s app. The envisaged new Sports Building will create a coherent whole from the existing dated facilities, provide additional changing rooms, replace the existing changing rooms and create a new Fitness Suite. Our sports hall and the changing rooms are 50 years old! Many of our readers will have memories of them and would recognise them today. The indicative illustration shows the proposed glass fronted fitness suite and new entrance to the PE building. A detailed feasibility study is looking at options which are on a larger scale than shown. Costs would be from £500,000 depending upon the final configuration. A detailed feasibility study for the creation of a STEM Centre and Chinese Language Centre has been completed. 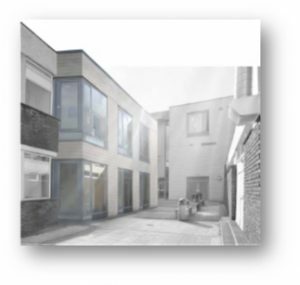 This would be formed by a two-storey extension of the South Campus into the middle courtyard area. The plan envisages creating two areas of 70m2 with the Chinese Language Centre on the ground floor and STEM centre on the first floor. The project has been costed on the basis of a number of contingencies which are unlikely to emerge as the site was previously built on in 2008. The maximum cost is just under £520,000 inclusive of VAT and all fees. The centre will improve opportunities for Jordanhill pupils and as an Advanced Higher hub will also broaden access for pupils from neighbouring schools. Pitches Appeal - Thank You! 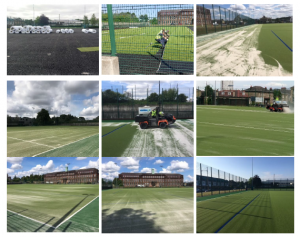 Over the Summer the all-weather pitch was replaced with a top of the range new sand dressed hockey surface and a new 3G surface laid on the MUGA. Here are some progress shots of the installation. Thank you to everyone who made generous contributions to the appeal for the new pitches raising over £12,600. The Development office was set up in August 2017 and co-ordinates activity relating to alumni, fundraising and future d evelopments of Jordanhill School. As our centenary approaches we aim reach out and build up on as many relationships with former pupils and friends of the School as possible. We hope to give parents, former pupils and friends the chance to deepen their involvement with the School and share in its success. All gifts received will go to the Educational Amenities Trust Fund (EA Trust) to be used in accordance with the Trust’s objectives. No funds will be used to pay for any of the core educational provision which is the responsibility of the state. Gifts will be directed to the Centenary Foundation Fund within the EA Trust which will support capital projects, our co-curricular programmes and the benevolent fund.